POPULAR REAR LOUNGE FLOORPLAN!! SLEEPS 6!!! ALL POWER OPTIONS!! The New Travel Trailer - 2018 Forest River Wildwood 28RLSS you are looking for is already out camping! 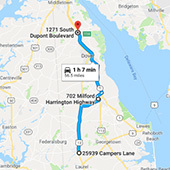 Here are some similar units from Delmarva RV Center in Seaford that you might enjoy!